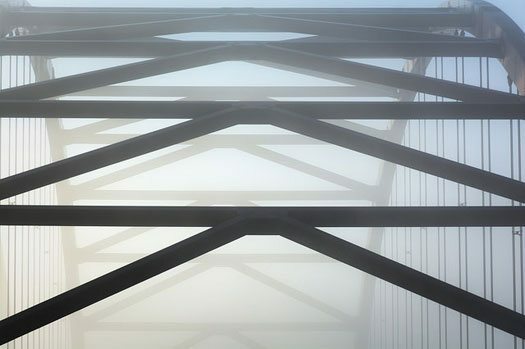 “Bridge of Uncertainty” by Matthew. Amend the Arkansas constitution to include requiring each voter to present proof of identity (such as a photo ID) to allow election workers to verify eligibility. Further evidence of the narrowness of the Court’s rulings on voter eligibility include its upholding of North Carolina’s voter ID laws while striking down Wisconsin’s laws. MSNBC reports that a new Texas law has been upheld by an appeals court but has been appealed to the US Supreme Court this week. Both sides in these cases point to a previous US Supreme Court decision, Purcell v. Gonzalez, which states in part that a court’s decisions on changing conditions for voting shouldn’t confuse voters right before an election. In other words, courts should not require changes in voting procedures when communicating the changes would tend to confuse people about to head to the polls. Those supporting state laws requiring identification to vote use Purcell to argue that courts should not intervene, especially now. Supporters of voting access without verification argue that a less restrictive approach (not asking for ID) is actually less confusing to voters than educating voters on what ID is needed to substantiate eligibility to vote. Correction: This article has been altered from its original form. The body that invalidated the voter ID requirement was the Arkansas Supreme Court, not the U.S. Supreme Court. NPQ regrets the error.